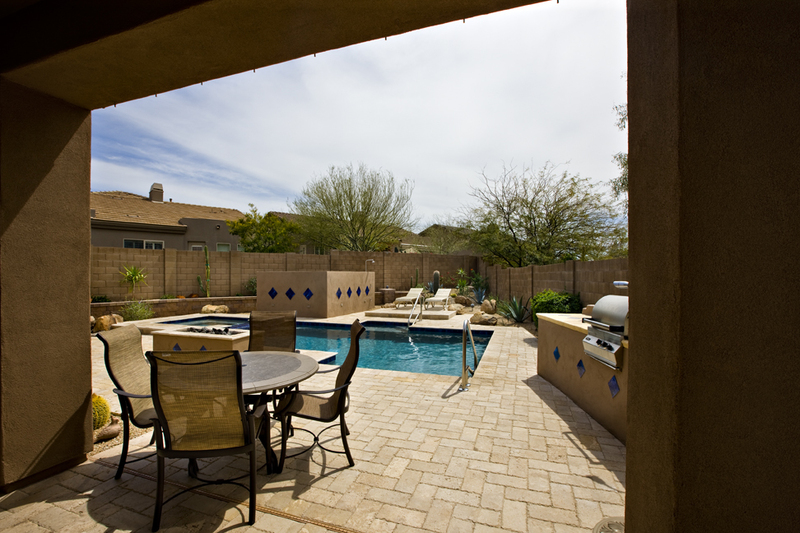 SOLD – Turn-Key North Scottsdale Home with Resort-style Backyard. 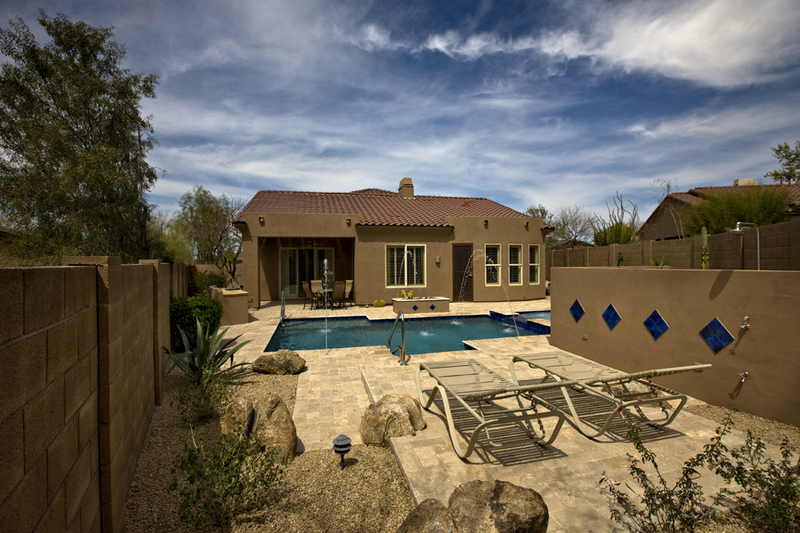 New (2009) custom pool with travertine decking and more! 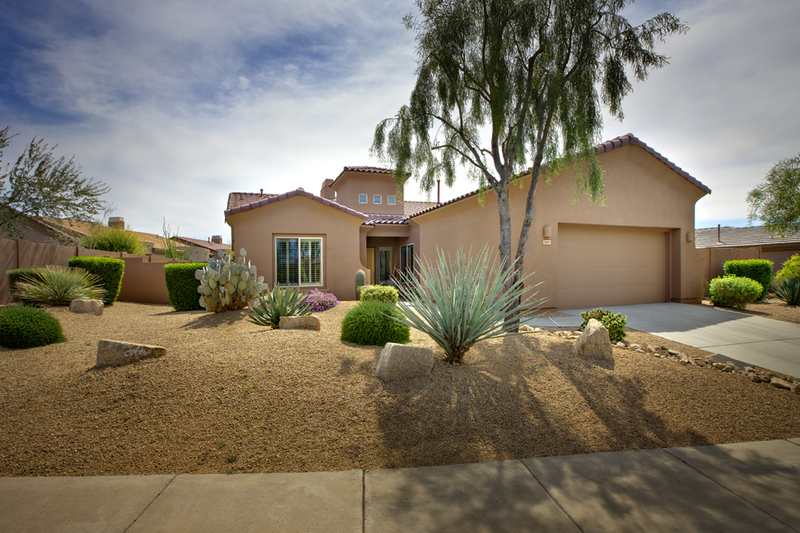 After entering Winfield through its manned, guarded gate for your extra security, you’ll arrive and be impressed with this home’s beautiful architecture, spacious front yard and (easy care) desert landscaping. Imagine yourself in this very social kitchen, entertaining your friends and gourmet cooking. 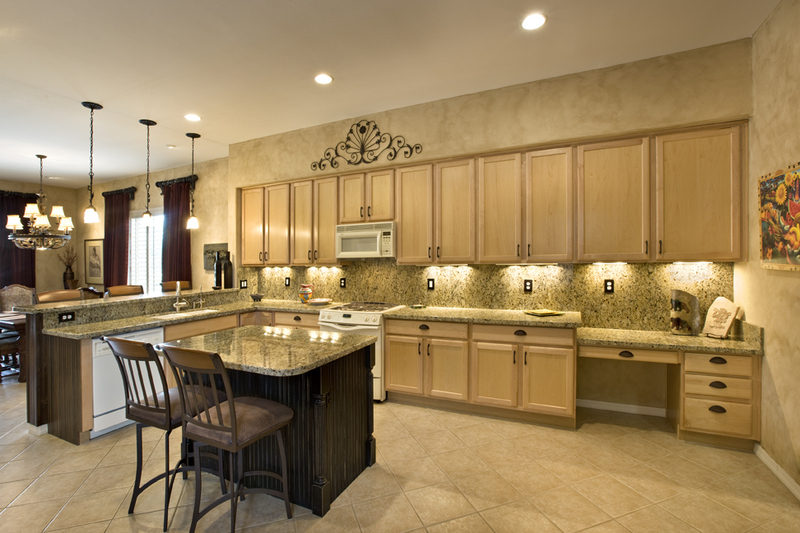 Tons of cabinet space and beautiful granite counter space make cooking a joy. You’ll love the kitchen island. Imagine your friends sitting at the TWO breakfast bars and chatting with you while you cook. The sellers customized this room by adding the beautiful stone wall with custom wood cabinets, an antique wood mantle and (hidden by the chair) a high efficiency, sealed glass, gas fireplace with outside draw. 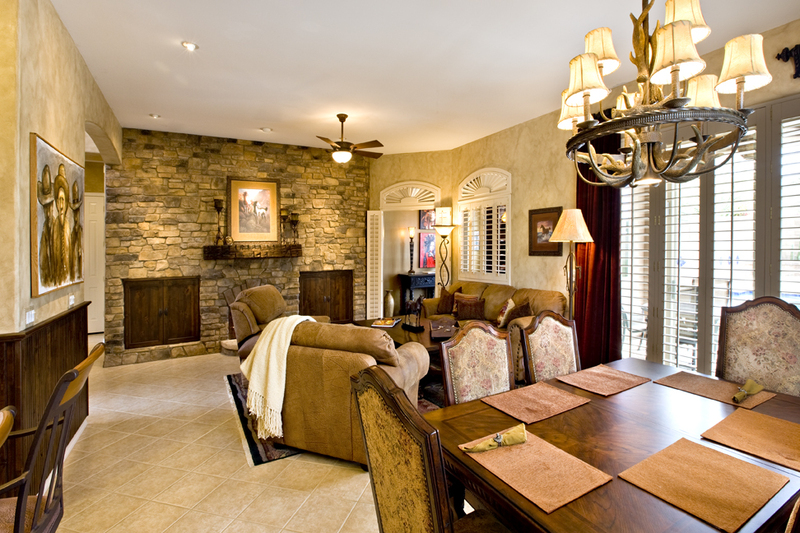 The cozy fireplace is often all you need to heat the home on a cool day. Did you notice how great the artwork on the walls looks? 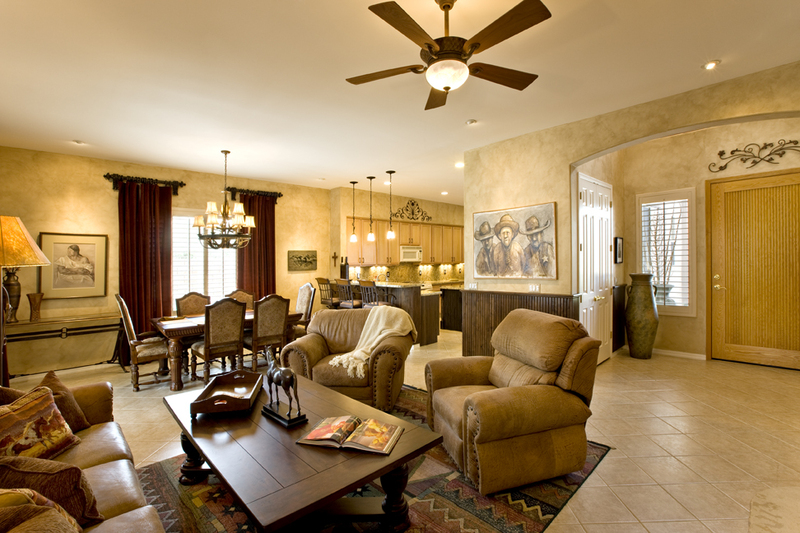 The sellers added custom accent lights in the ceiling directed toward the wall art. Simply fabulous! I love this peaceful den! The inspired paint job and complementary ceiling light jump out at you but also notice the flooring. The flooring looks like wood but it’s actually tile! So it has the beauty of wood and the durability of tile. 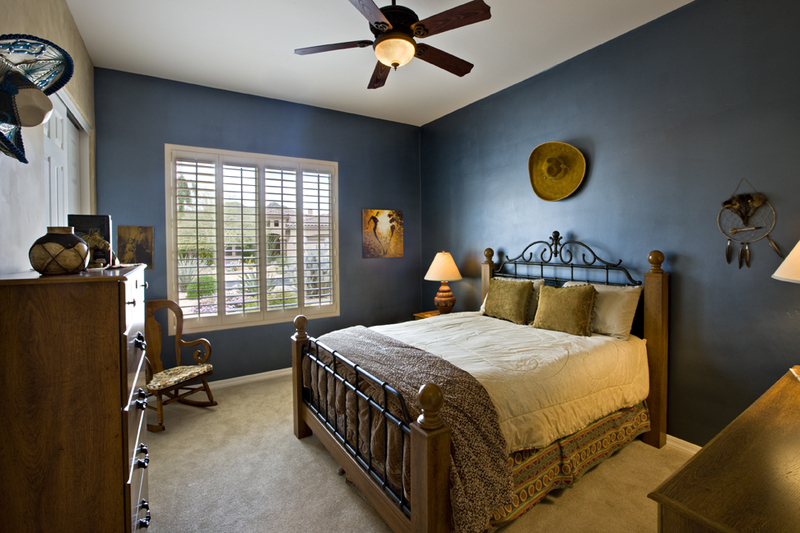 You’ll have plenty of room in this 16 foot by 15 foot master bedroom. The bedroom overlooks the pool and you and your spouse will have your own special doorway to sneak out to your heated pool and your heated spa. This nice sized second bedroom (14×12) has plantation shutters and its own separate entry to the hall bathroom to give your winter guests more privacy. And remember, this home can be turn-key for you because all the funiture is available on a separate bill of sale. 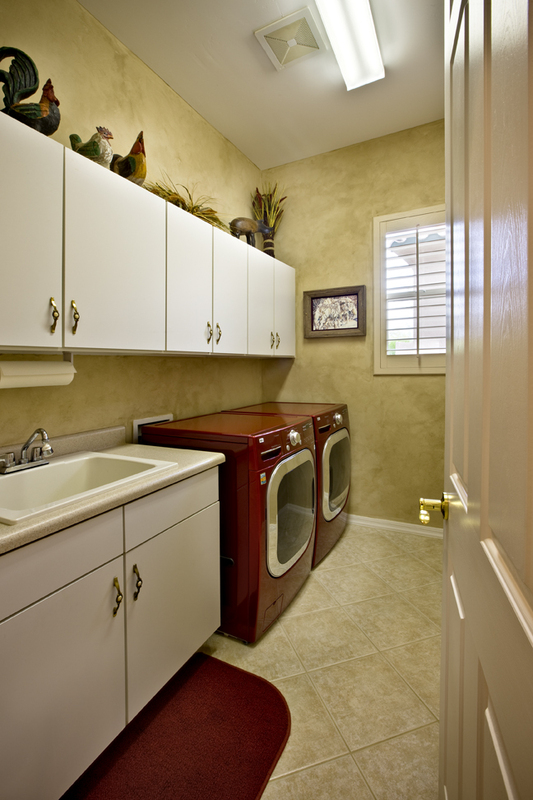 Okay, I don’t normally show the laundry room when selling a home but I wanted to point out to you the super high quality LG front-loading washer and dryer that are only a few months old. These machines show you the kind of quality the sellers put into all of their home improvements. The amazing part of this North Scottsdale home – what really sets it head and shoulders above the other homes for sale – is it’s resort-style backyard. The heated pool and spa are new (2009) so you’ll be able to enjoy them without worry. The sellers used top quality everything; heated pool, heated spa, in-floor cleaning system, waterfall, water jets, gas firepit, travertine decking, cooling mister and fogger system, top quality pool equipment, and a custom gas outdoor barbeque with large food prep/serving area. It has everything you wanted and a lot more! Do you think you would enjoy spending your days in the sun here? Would your friends and family enjoy visiting you here? From the beautiful landscaping to the gorgeous pool, you’ll love living the Arizona outdoor lifestyle in this spectacular home in Winfield in North Scottsdale, Arizona.